The worldwide events that commemorated the 20th anniversary of the Bhopal Gas Tragedy on 2-3 December, 2004, were solemn reminders of the need to keep Bhopal alive in the public eye. The book under review was brought out to coincide with the event. Its author, Ingrid Eckerman, was a member of the International Medical Commission on Bhopal that visited the site of the tragedy in 1994 and gave extensive recommendations for rehabilitating the survivors, medically. This book is the fruit of her personal research, which she undertook following the recommendations. What makes The Bhopal Saga interesting is the way Eckerman has marshalled her facts through use of a new model: the logical framework approach (lfa). According to the author, this model goes beyond the well-known Haddon model -- one that looks at the situation before the event, the event, and the post-event state of affairs as distinct entities. Besides other problems, the Haddon model does not emphasise ways to prevent the tragedy. lfa, in contrast, looks at the chain of events leading to the disaster; it analyses causes and effects. Eckerman has explained the model diagrammatically and one gets a clear picture of what caused the disaster; there is also lucid analysis on how it could have been averted. All this also makes lfa an effective tool that can be used to avert future industrial disasters. Good information The book is a veritable treasure trove of information--some well-known, others less so. Of course, some parts of The Bhopal Saga are more incisive than the others. Amongst them is the section titled, "The content of the cloud and its effects". The section gives a very good--in fact a scary picture--of the morbidity caused by the tragedy. The part also links up very well with the subsequent section: "Post-event phase". The long term medical affects of exposure, and the research undertaken by different government, international and non-government agencies are taken up for minute scrutiny in this section. Facts are rallied round to prove Eckerman's central thesis of corporate negligence and lack of will on the part of the government. The book also helps one nail the outrageous lies of those who claim that the Bhopal survivors are faking their medical problems. A question But the question that comes to this reviewer's mind is: does lfa allow us to understand facts beyond the 1994 watershed? The Indian Council of Medical Research wound up its Bhopal-related research that year, signaling the final "settlement" of liability and compensation issues. Eckerman does carry her thesis forward right up to the present time. But her lfa model has limitations. It is not enough to say--as Eckerman does--that Bhopal is relevant because we have not learnt our lessons; we must also understand that Bhopal remains an ongoing disaster. The lfa model does not help one comprehend this grim reality. So, The Bhopal Sagaremains another attempt to analyse the "event" of a disaster, rather than an exploration of the many "continuing causes" that make the disaster ongoing. 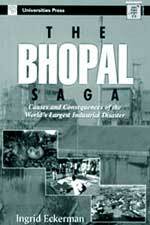 Nevertheless, the book is a vital addition to any reading list on Bhopal. Exhaustive bibliographies at the end of each chapter add to its value--one does miss an index, though. Eckerman's professional background gives the book sharpness of perspective. Her lucid writing style makes The Bhopal Saga accessible to both specialist and lay reader.